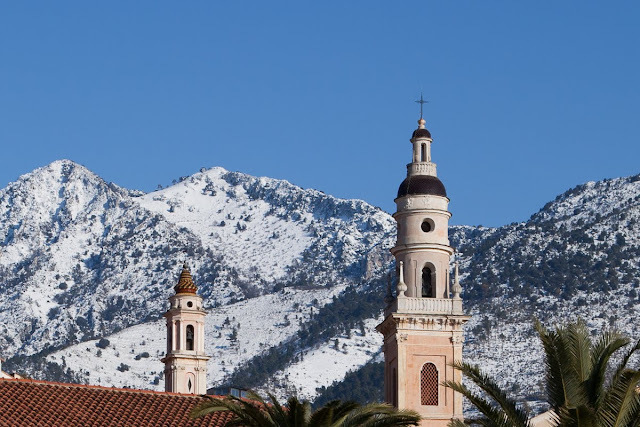 Menton Daily Photo: Snow in Menton! Snow on the hills above Menton. 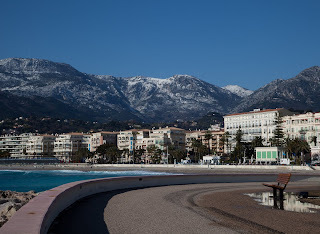 Neige sur les hauteurs de Menton. Fabulous shot Jilly, it looks amazing with the blue sky and palm trees in the foreground and then the huge snow covered mountains behind, such a contrast. What a great post card picture (except better)! This is beautiful Jilly. Is it rare to get snow? Jilly this is SO EXCITING ! The WOW effect is there - how STUNNING ! I'd been wondering whether you'd had any snow, the answer is YES ! What a sight, Jilly! It looks beautiful, but maybe too close for comfort. The weather is certainly strange this year. Our part of the Midwest is usually cold and snowy in January, but we just had our fourth day in the 60's. (This has NEVER happened before. )If we had a beautiful blue sea, it would be perfect. I was in a tabac in Menton a few years ago and they were selling a snow-dome souvenir with a little diorama of Menton inside. 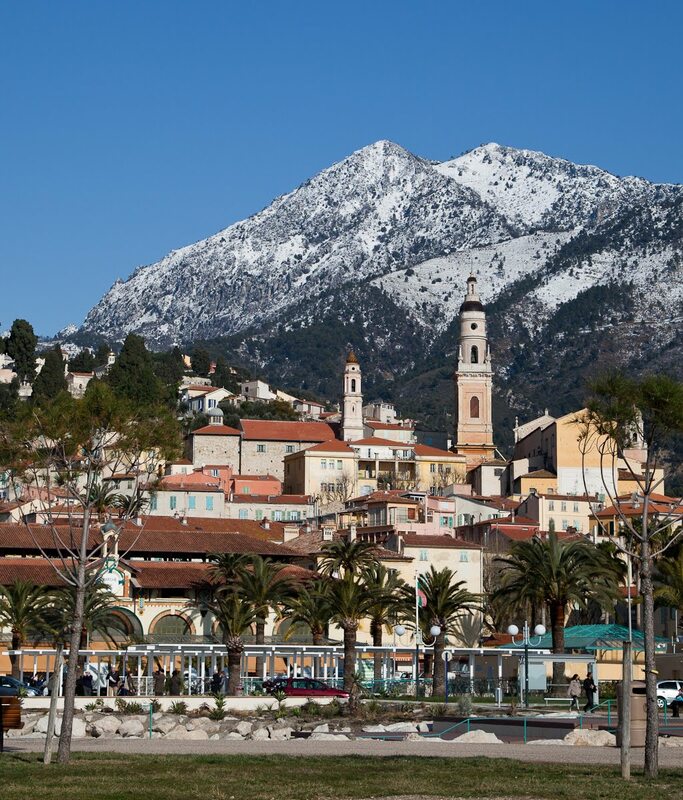 When you shook the dome fake snow would fall over the Menton scene. I asked the owner 'does it ever snow in Menton'? She said 'Oh yes! I snowed here in 1967'. So this is pretty unusual this weather event I'd say. Amazingly beautiful! First one is definitely fabulous! Jilly I came back to enjoy this scene again, it is so beautiful. Is it all melting now or is it so cold that it's actually holding? Thanks everyone for the kind words about the photo. 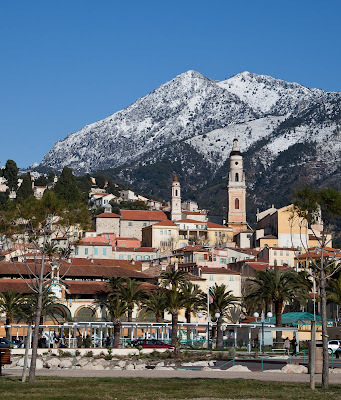 To those who asked, it's rare to have snow actually falling IN Menton, but not unusual to have it on the hills above, which is what happened a few days ago. I live just below the village of Gorbio and on several occasions have been 'snowed in' unable to get up the track. But right, one year - was it 1967? - photos were taken of snow in the Jardin Bioves and I believe, that year, the citrus crop was ruined. Nathalie, I don't know if it's still on the hillside above Menton or not, as I've not been out today but I'd guess it is as we still have snow on the hills here, below Gorbio. I'll be checking tomorrow! Hope you get snow in Avignon soon! This looks so unusual, unreal, unfamiliar to me as I know this place only in summer. The scene with snow in the mountains is in the "wow!" category. Excellent. This makes such beautiful contrast. That first photo is stunning beyond stunning!